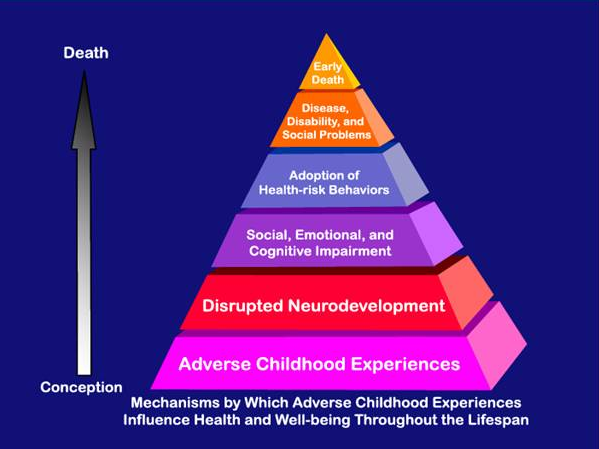 The Adverse Childhood Experiences Study (ACE) is one of the most important research studies of the impact of adverse experiences in a child's life. The study began as a project to treat morbidly obese patients; however, Dr. Vincent Felitti came to understand that the patients viewed their excessive weight as a protective factor because they had experienced childhood trauma, particularly sexual abuse. These findings led Dr. Felitti and Dr. Robert Anda of the Center for Disease Control (CDC) to create of study involving over 17,000 middle-age patients in order to understand how childhood trauma impacted their health. 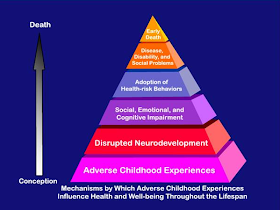 This became the original ACE (Adverse Childhood Experiences) research. The first study was released in 1998 and since that time the CDC has sponsored at least five additional studies in other cities that confirmed and expanded on the findings of Dr. Felitti. There have now been over 80 research papers written for medical professionals about ACE research. Patients were asked about ten different types of trauma in their childhood. The traumas were selected based on their prevalence in the obesity program. The traumas considered were domestic violence; physical, emotional, or sexual abuse; an adult in the household who engaged in substance abuse; was imprisoned; depressed or mentally ill; separation from at least one of the biological parents; emotional neglect; and physical neglect. An ACE Score was created wherein the patient received one point for exposure to each type of trauma. The point was given whether there was one incident or many so the calculation often understated the harm. The fundamental finding in the ACE research is that children exposed to domestic violence, child abuse and other trauma will suffer more illnesses and injuries throughout their lives and have a shorter life expectancy. The harm is cumulative. If a child was exposed to domestic violence, verbal, physical and sexual abuse, that would create an ACE score of 4. If one of the parents also had a substance abuse problem or these events led to the removal of one of the parents from the child’s life the ACE score would be 6. At this level a child has a life expectancy twenty years less than a child with none of these traumas. On first consideration these findings are depressing, but they also offer an incredible opportunity. If society can protect children from domestic violence and child abuse, we would enjoy a dramatic improvement in the health of children and adults with huge financial savings. The initial reports and articles have been directed at the medical community. This is useful because doctors can use this information to diagnose and treat adult patients suffering from a variety of illnesses that were caused by trauma experienced decades earlier. Understanding the pathways from abuse to illness will help professionals develop appropriate responses to domestic violence and child abuse. Domestic violence involve tactics abusers use to coerce and control their partners. The purpose of the tactics is to frighten and intimidate the victim so she does what the abuser demands even if she does not agree. Even more than the immediate harm from any physical abuse, it is this stress and fear that impacts victims and their children to produce the long-term medical risks. Many common diseases are caused or exacerbated by stress. The stress also causes inflammation which is associated with many health risks. The abuse and stress also lead to eating and sleeping disorders which in turn cause still more medical problems. Domestic violence and child abuse are also linked to depression and PTSD. The laws that require courts to consider domestic violence when making decisions about custody and visitation were based on research that children exposed to domestic violence were more likely to make a variety of poor choices. This leads to problems like substance abuse, crime, prostitution, teen pregnancy, dropping out of school, self-mutilation, suicide and depression. Significantly, these health problems and poor decisions interact with each other to increase risks exponentially. How domestic violence and child abuse harm children is critical to understanding the most effective responses.